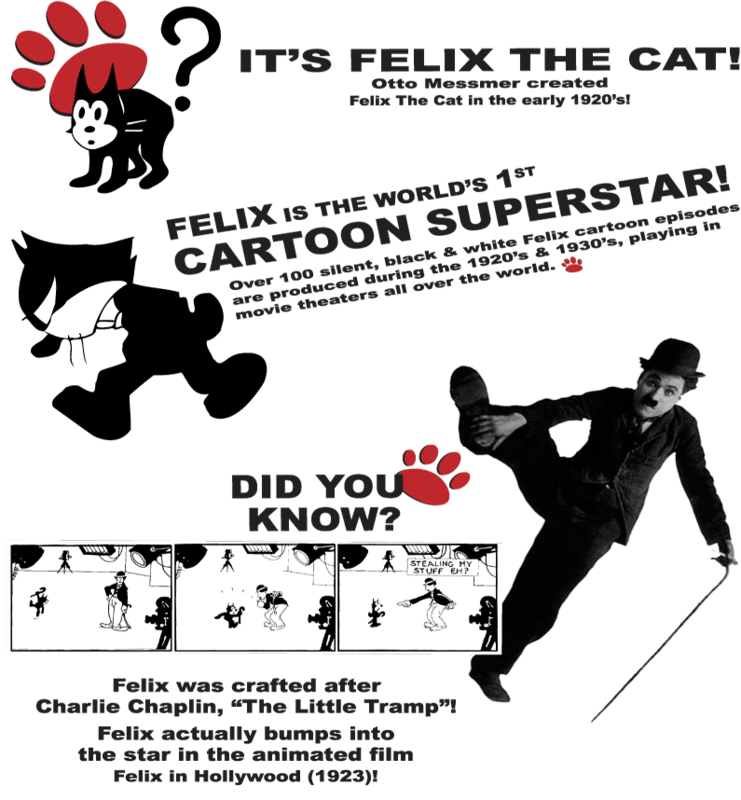 FELIX THE CAT had a very humble beginning as a curious, mischievous and inventive little character as first conceived by New Jersey cartoonist Otto Messmer. He was more popular than the live silent movie stars and world leaders of the same era. His squat, angular, black body and huge, wide eyes and grin were instantly recognizable. He is considered the first true animated movie star. His first appearance was in a short film called Feline Follies. Soon thereafter he made the transition from screen to print. King Features syndicated Felix in over 250 newspapers in a multitude of languages, reaching practically every corner of the globe. Today he's published through Felix Comics, Inc., in various magazines and publications. No one suspected back then that this cubist-looking and almost grotesque Felix would metamorphosize into the rounder, more lovable character he is today. 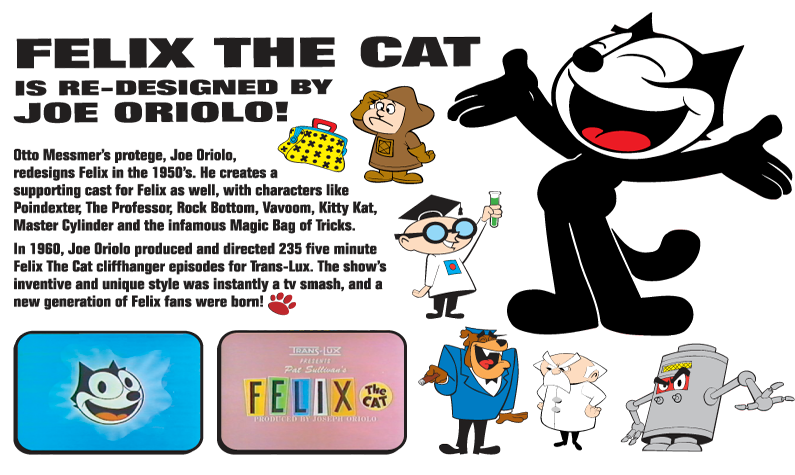 Throughout his career, Felix the Cat's originator, Otto Messmer, was always doing what he loved to do...draw, animate and create visual gags! He had no idea that Felix would cause such a sensation! 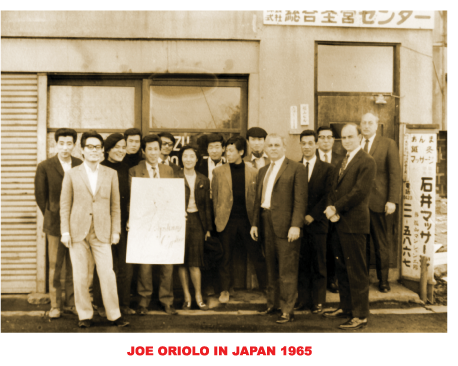 It wasn't long before a young Joe Oriolo, Otto's assistant and protégé, began working closely with Felix. Joe had a love for the character from the beginning. Joe Oriolo brought with him almost two decades of animation and cartooning experience, having worked for the famous Fleischer Studios on the Popeye and Superman series, Gulliver's Travels, Mr. Bug Goes to Town and many more! Joe's experience and talent brought Felix to the next level of evolution. Joe began to work solely on Felix and received from his good friend Otto a "carte blanche" to create a "new Felix". 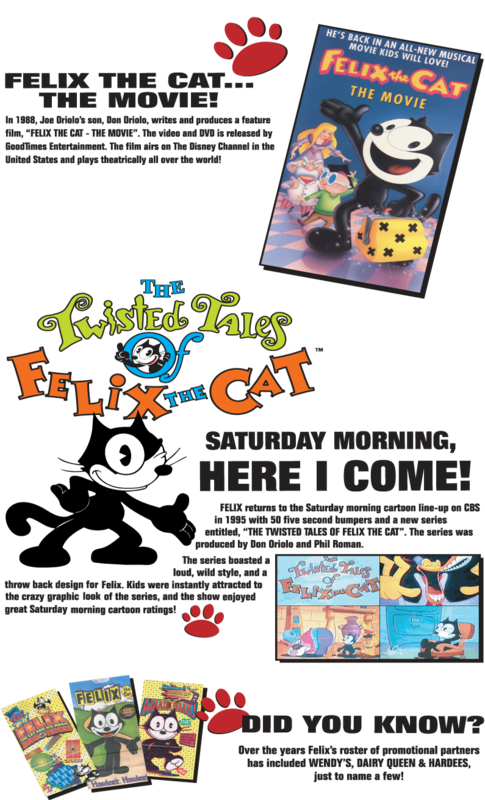 Joe Oriolo thus created the new Felix with a new image, new personality and new characters, including The Magic Bag of Tricks, Poindexter, The Professor, Rock Bottom and Vavoom. These are the Felix series characters we know so well today. The Felix timeline holds many historic milestones! Felix became so famous that he was chosen as mascot by Fighter Squadron 2-B, emblazoning their F-3 biplanes with a logo of Felix holding a bomb. Felix’s image was the very first image to be broadcast over the television airwaves. That’s right! When the engineers at RCA Research Labs were creating the phenomenon of TV, they used a rotating Felix doll as their test model in their very first transmission on NBC, an historic moment! 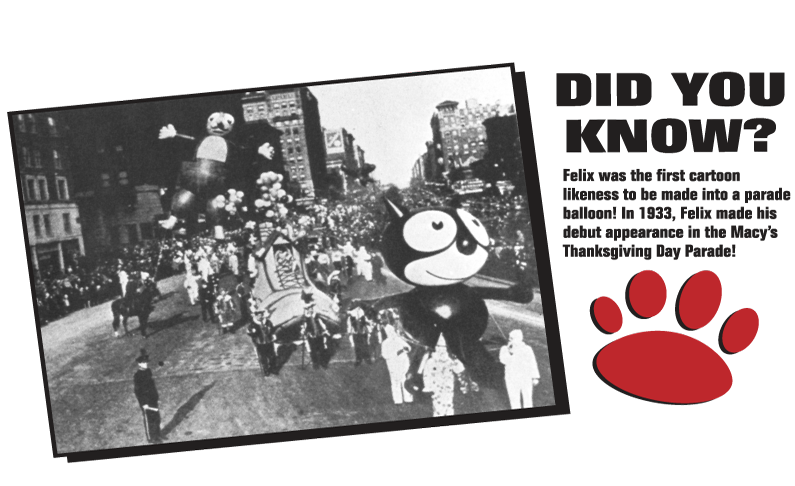 Felix has image adorned clocks, Christmas ornaments, and was even the first balloon featured in the Macy’s Thanksgiving Parade. The only two cartoonists ever to draw the Felix Sunday comics in the newspapers and comic books in those early days were Otto Messmer and Joe Oriolo. At this point, a young Don Oriolo began his close relationship with these popular characters. Don spent many hours looking over the shoulders of both his dad and Otto Messmer as they drew the Felix newspaper strips and comic books. As the new Oriolo-drafted Felix became more trendy, so did the desire by the public to have Felix dolls, cards, toys and jewelry. By the end of the 50s, Joe Oriolo produced 264 five-minute episodes of the new Felix for Trans-Lux TV that were immediately picked up for first-run syndication. They were instantly embraced by not only children, but adults as well! The entire series of cartoons ran continuously for the next 20 years. These shows are still being shown around the world. Near the end of his career, Joe Oriolo, recognizing his son Don's imagination and passion for Felix, asked him to bring their beloved Felix into the twenty-first century. With great admiration of all that is Felix, Don Oriolo continued the legacy of his father's work. Don had learned well from his father, inheriting his gag development and storytelling talents. 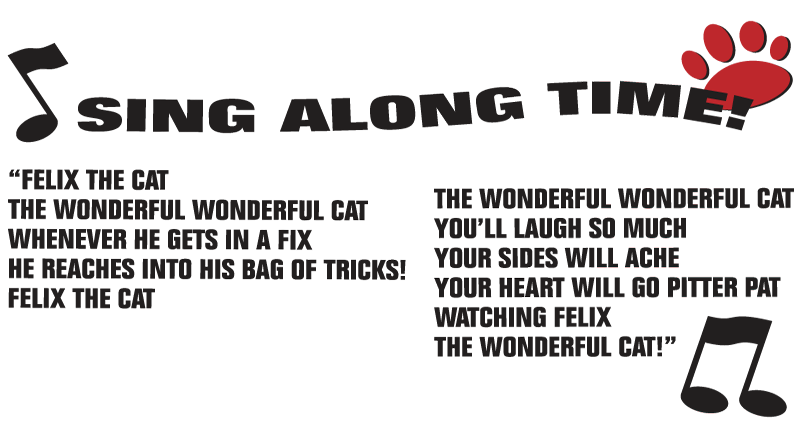 And in turn, Don has brought his son, Michael into FTCP, working shoulder-to-shoulder to keep FELIX THE CAT at the forefront in popular culture around the world and continuing the work and creativity started by Uncle Otto Messmer and Joe Oriolo. Felix’s popularity never stops growing! Could it be because he’s a nostalgic figure? Or that he represents Americana? Or that he continues to win over new audiences with his winning personality, humor and visual appeal? Yes, yes and yes! Ask Don where Felix is heading, he'll smile and tell you "on the same straight and narrow path to success that was paved by my uncle Otto Messmer and my dad, Joe Oriolo!"